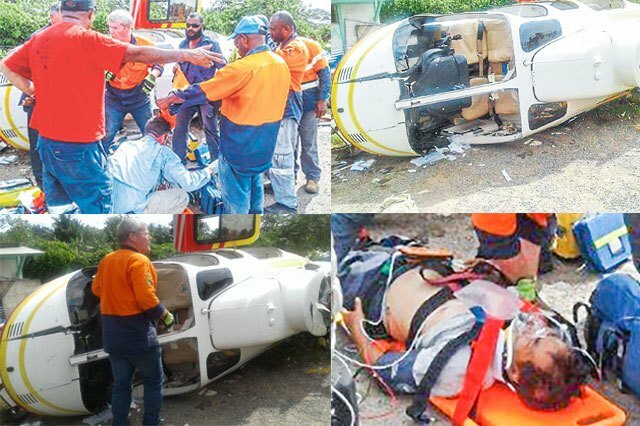 Two people were injured when a helicopter crashed crashed while trying to lift two drums off the ground at Kiunga Airport, North Fly in Papua New Guinea, Police told local Media yesterday afternoon. Provincial police commander Superintendent Joseph Puri told The National from Kiunga that the pilot of the helicopter was injured. He also said another person was injured after being hit by the propellers. Both were taken to hospital for treatment. An eyewitness who asked not to be identified said the helicopter crashed at around 3pm at the airport. The witness said the helicopter was trying to lift about three or four 44-gallon drums when it crashed and landed on its side. The witness said the pilot was the only person on board the helicopter and sustained injuries. Efforts last night to get a comment from the Accident Investigation Commission were unsuccessful.